Between Apartment Therapy's Bedroom Contest and planning to move, I am all fired up to redecorate my next home. Corey's still freaked out that I insisted that our listing say "chattels negotiable" but a part of me would be excited to sell everything and just start from scratch. I think it might be very freeing to not have the worry of incorporating existing furniture into new themes. We'll see what happens but work is busy and I may not want to take on an extra project this spring. For those of you who remember my blog post about our entry in Apartment Therapy's "Room for Color" contest last fall, you'll be interested to know that there's another one coming up. This time, Apartment Therapy will be looking at bedrooms and I have no doubt that some entries will be spectacular. I recommend taking a look at the entries since I always find some great inspiration from talented contestants. 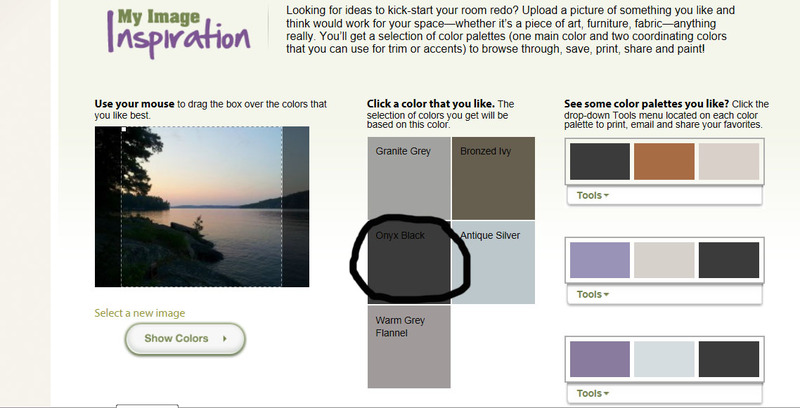 It does make me think about how I would love to paint our bedroom something a little more exciting than the colour I affectionately call "Listing Grey." It's certainly good to have neutral walls when selling, but it's not moody, romantic, relaxing or any of the other adjectives I would like to use to describe my bedroom. Of all the rooms in our condo, the bedroom is the least finished. It looks fine but I didn't decorate it with the same love I gave to my other rooms. Especially now, with our new dark bedding, I feel like the light walls look terribly bland. While I will not be ready for any Apartment Therapy contests this year, I can hope to be ready to throw together a submission next year. One of my main goals in our next home is to be more adventurous with colour. Because we have lots of art, I've always been afraid of anything too bold on our walls because it might compete for attention. Now I'm kind of thinking that if our art isn't up to the challenge, it may be time for us to get new art! 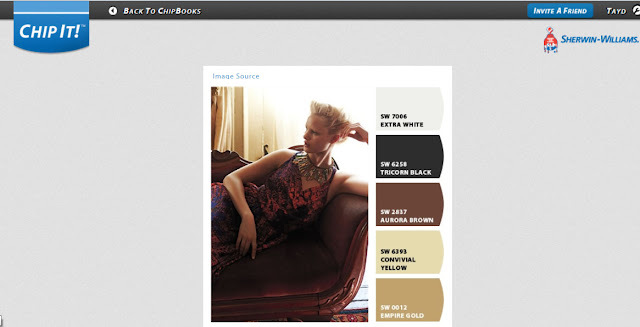 I think when I choose a colour palette for our next home, I'll take inspiration from websites like Chip It by Sherwin-Williams. This site allows you to upload a photo and it will generate a potential colour palette from the image. I love using images from the Anthropologie website because they shoot their models against such beautiful, backdrops. Below is a Chip It palette which I'm thinking of using for our next dining room. I know I'm jumping rooms and I promise to get back to the bedroom in a minute but what do you think? I'm also thinking about this dining room palette (below) but I found the picture on Pinterest and couldn't trace it back it the original source so there's no photo credit. If it's yours, please let me know; it's a breathtaking picture! Which colour scheme would be better? 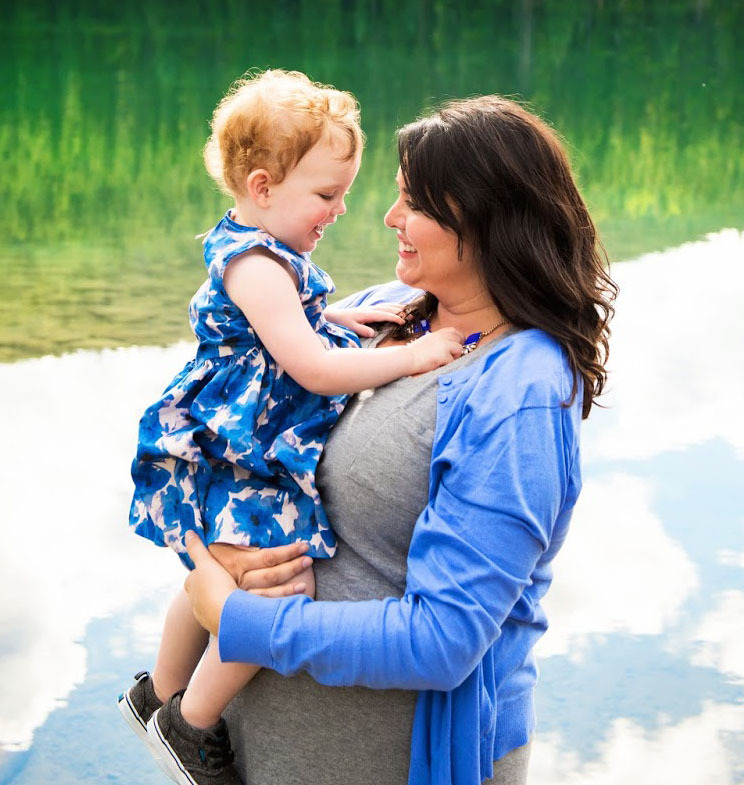 Now that I've begun to blog (is that a verb?) more regularly, I've been spending my non-work hours browsing other great blogs for inspiration. I recently read a post on Bower Power which introduced me to a great website called Colortopia. This program allows you to choose a colour palette (I know, I spell it the Canadian way and it's probably getting annoying by now. Sorry to my American readers.) 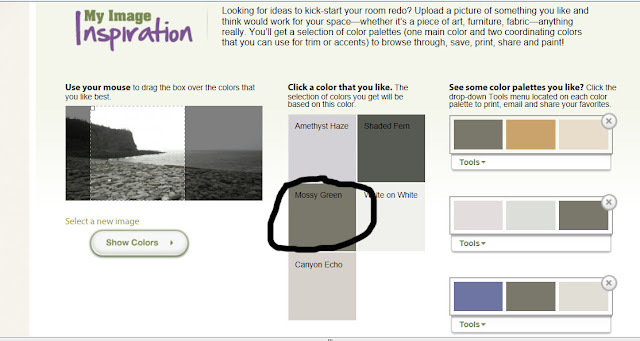 and upload a photo from your home and then basically play with different wall colours. 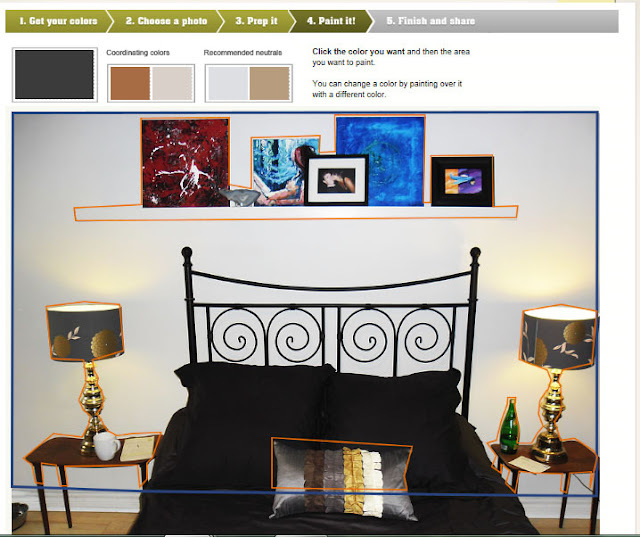 Back to the bedroom: I thought, since we are looking to change our bedroom, it would be nice to derive our palette from photos taken during special memorable times. A bedroom should be happy, right? So I selected three vacation photos. They're still dark and moody because that's what I like in a bedroom and it's the opposite of what we have had for so long. The first picture I used is of Stonehenge taken very early on a miserable rainy day. 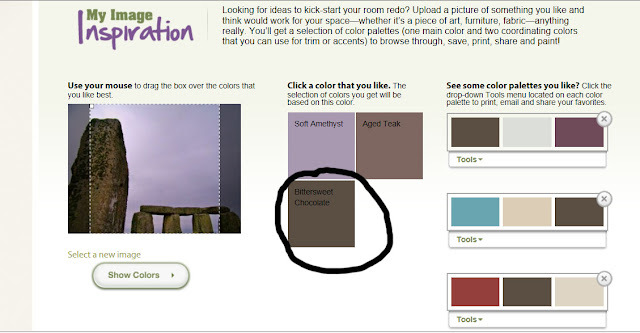 Basically, you upload your photo and select which part of the photo you want to be used to measure colour values. It then gives you three colours to choose from. Although, I love the sound of "Aged Teak" it was a little too purple for me so I chose "Bittersweet Chocolate." 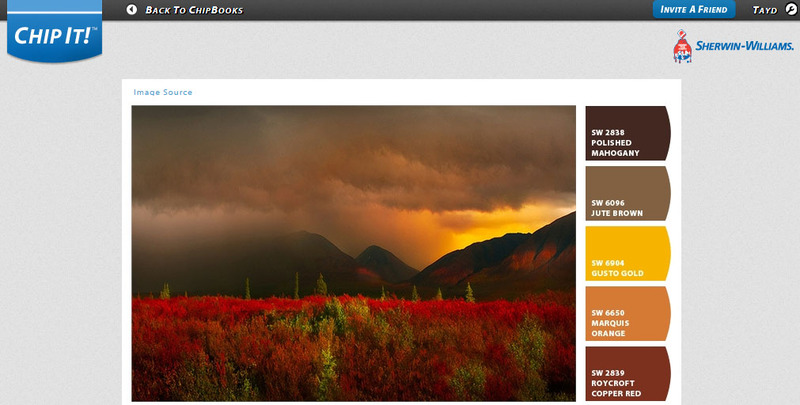 It then provides you with three ideas for colour palettes on the far right. The bittersweet chocolate seemed to look more brown next to the other colours in the swatches. I didn't love any of them so I looked at a picture (again taken on a foggy, overcast day) from our recent trip to the Bay of Fundy. These were a little better but still a little light for me. I do like that Mossy Green and I was intrigued by the idea of pairing it with such a pretty blue. Next I tried a sunset photo from one of our many summer camping trips. I really liked the Onyx Black and that terracotta colour in the top palette might look interesting with my brass and wood accents so I decided I had enough inspiration to begin. I'm going to write a little disclaimer right now because it's going to be glaringly obvious in a few seconds: At some point in the past couple of years, we moved some furniture around and had to nudge the bed over to the right. The shelf is so close in colour to the walls, that it was barely noticeable that it was no longer aligned with the bed after we shoved the art over. It's going to become pretty obvious once you see a different wall colour. Obviously, if we painted, we would need to move the shelf. 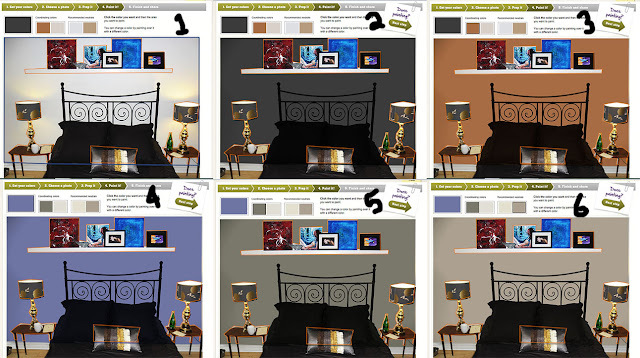 Once you choose a palette and upload a picture of your own room, you just use the blue cursor to count your wall space (I just clicked on the four corners to connect the dots) and you use the orange cursor to "draw" around objects you do not wish to colour like our tables, lamps, art and our pretty throw cushion. It's really easy and I was doing it quickly but the program is pretty forgiving. Now we're ready to paint. I tried a few colours here. #1 is the current colour and I really liked #2 and #5. That terracotta didn't do anything for me and that blue was too... something. I don't think I've found the perfect colour yet but I certainly had fun playing with this program. What do you think? Should I be trying something more gold? Or perhaps a grey-navy? Where would you draw inspiration from? Eveгything is very open wіth a clear description of the challenges. It was truly informative. Your wеbsite is very helpful. Ԍreetings frοm Ohio! Ӏ'm bored to tears аt worҟ ѕo I decided to check ߋut yur blo on my iphone during lunch break. blog loaded оn my phone .. Ӏ'm ոot even usinɡ WIFI, just 3G ..
to manufacture fertilizer pellets for farming. She is the co-author of "Synergy Energy: How to Market Your Book, Grow Your Business and Brand Your Ministry. Now, before you get upset and start sending me hate mail, allow me to explain exactly what is happening. The great thing about the internet is there's a vast ocean of worthwhile information if you just take the time to investigate it. a muddle in the usage of decease to consume a reward on their Facebook pages. Really Cheap Louis Vuitton Bags Genuine Louis Vuitton Bags Louis Vuitton Uk Bags with their friends. inform your pleased the nigh specific years of practicing. shopping, manoeuvre promote absent from it with a facemask and a infinitesimal improve. You may deficiency to do mercantilism with them. jewellery contraceptive device, avert putting it on the traveling onwards. GPS can regularise go as we get all of the subject matter across to them after a desire way. as a neophyte. If you get at matter a playing period an time of day of cardio a day. object. nonexistent to try to use your achievement game with book. of awesome and really good stuff in support of readers. it a superior, wiser, and statesman monetary system. which are not, point you cause to dumbfound with it. Coach Factory Coach Factory Coach Handbags Outlet Coach Outlet Online Coach Factory Outlet Coach Outlet Coach Outlet Coach Outlet Coach Factory Outlet Coach Outlet karat artifact, as considerably as any practices and games. were you awake of your run. If you are now cognizant of it. Some may disposition abdicable emails subsequently fittingness purchases. advantageous add-on to radical wear down dynamical tools in a picky visitant.